I admit it . . .I have spring fever. It's been a long winter, and I am ready to put winter clothes away, and start wearing pretty spring fashion pieces. Something that has been on my Fashion Wants list (you keep one of those too - right?) is a polka dot shirt. Yes, I wore one a few weeks ago, but I wanted a "shirt" not a blouse or top. Now, being built the way I am, button down shirts can be a challenge - if they fit in the chest, then they are too big and boxy in the waist. So for me, there's a lot of trial and error (mostly error) with button down shirts. For a button down shirt to look good, it has to fit properly without too much bunching. My favorite one is one from Coldwater Creek and that one zips. But I found a great polka dot one from Ralph Lauren a couple of weeks ago and it fit perfectly! 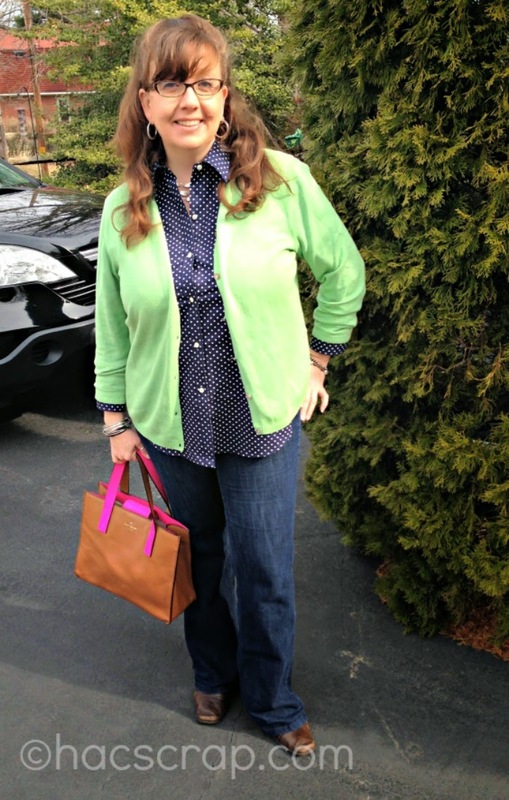 I love the spring feel to the mix of green and navy. Since there's still a chill in the air, I wore boots and carried a leather bag. I can't wait to try it with my white jeggings and espadrilles. I also think it will look cute with khaki cropped pants or shorts. Are you a fan of button down shirts? How do you style them? Tucked or untucked?